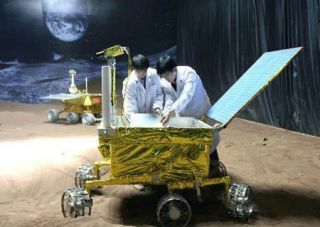 Space engineers have started work on China’s lunar rover, one aspect of a multi-pronged Moon exploration program. A cooperative deal has been inked between a U.S. group and China to use that country's moon lander to conduct astronomical imaging from the lunar surface. The International Lunar Observatory Association (ILOA) of Kamuela, Hawaii has signed a memorandum of understanding with the Beijing-based National Astronomical Observatories (NAOC) of the Chinese Academy of Sciences. A signing ceremony took place in Kamuela on Sept. 4. The deal is the first such U.S.-China collaboration centered on using China's Chang'e-3 moon lander now being readied for launch next year. The Chang'e 1 and Chang'e 2 lunar orbiters were launched by China in 2007 and 2010, respectively. The most recent orbiter cranked out a detailed map of the moon's surface, including the landing zone picked for the rover-carrying Chang'e 3 lander — Sinus Iridium (Bay of Rainbows). "I've been visiting China observatories and astronomy facilities like NAOC for about 15 years, so this memorandum of understanding has been a natural progression," Steve Durst, ILOA founding director, told SPACE.com. This science collaboration will be part of a mission that will conduct the first soft controlled landing of any spacecraft on the moon in almost 40 years, Durst said in a press statement. It will be the first ever program to conduct astronomical imaging from the moon's landscape, he said. The ILOA co-sponsors with its Space Age Publishing Company affiliate a number of educational initiatives, international forums to provide increased global awareness of space science, exploration and enterprise, Durst said. Forums are held in Silicon Valley, Canada, China, India, Japan, Europe, Africa, Hawaii, Kansas and New York. Current plans, Durst said, are for expansion to South America, Southeast Asia, Mexico and Antarctica through 2014. "We're optimistic that resulting Space Age USA-People's Republic of China -international interaction should be very productive for all," Durst said. The deal struck involved quite an effort, he said, calling it "hopefully quite significant and historic." Durst said that the exchange in kind calls for China's NAOC to receive observing time on the ILO-X and ILO-1 mission instruments — science gear that's part of the International Lunar Observatory Association's work with Moon Express, a Google Lunar X Prize enterprise based at NASA Research Park at Moffett Field, Calif. That prize has groups vying for a $30 million purse for the first privately funded team to send a robot to the moon. The ILO-X is an optical telescope precursor instrument, part of a joint venture with Moon Express in a bid for the Google Lunar X-Prize. In a July statement, Moon Express said it has designed and is building the ILO-X as the first independently developed astronomical telescope that will operate on the moon, looking out at the galaxy and heavens beyond and back at the Earth. About the size of a shoe-box, the ILO-X will use leading-edge optical and imaging technology to deliver dramatic and inspiring deep sky pictures of galactic and extragalactic objects, according to Moon Express co-founder and CEO, Bob Richards. ILO-1 is the primary ILOA mission under development by MDA Canada to land a multifunctional 2-meter dish at the moon's south pole to conduct astronomical observation and commercial communications activities. Regarding the newly signed memorandum of understanding, Durst said: "Of course, I'm both amazed and sad that there's no American lander operating on the moon too…public, private, any kind," Durst said. He called the moon's south pole "the next new frontier."